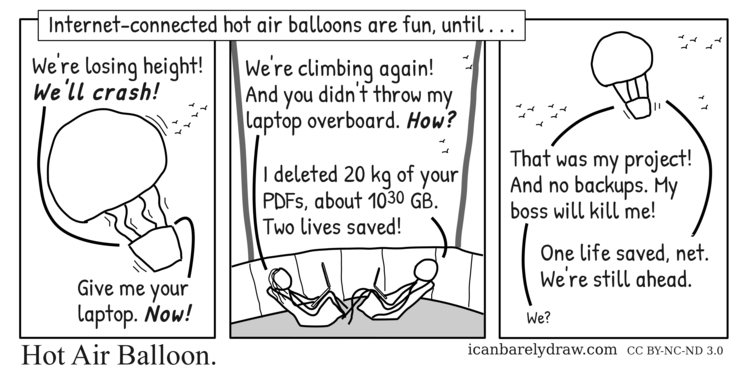 Narrator: Internet-connected hot air balloons are fun, until. . .
A hot air balloon is in the air looking unstable. Birds are flying in the background. Voices come from a basket hanging from the hot air balloon. Voice 1: We're losing height! We'll crash! Voice 2: Give me your laptop. Now! In the next scene, a man and a woman are seated on reclining seats. Each has a laptop computer. In the background we see what could be the inside wall of the basket hanging from the hot air balloon. Birds are flying in the background. Woman: We're climbing again! And you didn't throw my laptop overboard. How? Man: I deleted 20 kg of your PDFs, about 10**30 GB. Two lives saved! The exterior of a hot air balloon is seen. The balloon looks stable in the air. Birds are flying in the background. Voice 1 from basket hanging from hot air balloon: That was my project! And no backups. My boss will kill me! Voice 2: One life saved, net. We're still ahead. Voice 1, in a smaller font: We?